The first step in creating this program is to fully understand your environment. What works now? What isn’t working? What best practices are the high achievers using that the others aren’t? How can you build an entire sales force of high achievers? These are great questions — and ones we will get answers to. Our program starts with a 360º Assessment & Recommendations of not only your sales force’s strengths and opportunity areas, but your sales department’s too. Interview key sales reps in the organization to define their goals, challenges, concerns and existing selling effectiveness. Each will also complete an on-line personal Selling Skills Assessment (SSA). Reps will be asked to perform role plays, customized for your specific industry, to give us an understanding of their current selling skill set. Interview sales leaders/manager(s) to understand how the team is currently being managed and understand specifically how the department operates. This spans dozens of topics inspecting such areas as reporting, remuneration, accountability, sales meetings, recruiting, hiring, training and development process review, rewards and recognition, culture and values alignment assessment, and competitive review. The selected sales leaders will complete an on-line Sales Department Assessment (SDA) where they will rate their department’s effectiveness in key result areas. Observe different sales representatives in the field (optional) to see in real time what is working well, and what needs to improve. If you continue with a complete sales team development program, the 360º will begin the “buy-in” and commitment process of the people participating in the program because they are a part of its development. When they see their input reflected in the program, it enhances their involvement and commitment, which increases the effectiveness of the skills development portion. Understand the key measurements so that the management team can determine whether the sales reps are doing what is necessary for your company to achieve its sales goals. We take the results of our extensive investigation and custom design an actionable 360º Assessment & Recommendations document to meet your specific challenges head-on. It highlights our findings, observations and accurately rates the current sales effectiveness of your team. Actual specific comments from Intake Interviews are summarized (but not attributed to any one individual so as to maintain confidentiality). The numerical results of the SSA’s and SDA’s will be averaged, establishing a baseline to work from. The 360º also recommends specific, practical strategies to improve sales department results in any area that needs work, in both the short and long term. It provides powerful recommendations that cover everything from recruiting practices to sales management processes and structure which will ensure positive changes that are sustainable and long-term. We will give clear, concise, sometimes even blunt, advice that is guaranteed (see below) to increase sales in your organization. 6. Coaching Responsibilities and Actions. R.O.I. Guarantee: Our goal with the 360º Assessment is to provide you insights and recommendations that, if implemented, will increase your sales department’s performance. If, after reviewing the findings and recommendations, you don’t agree that they will lead to an increase of gross profit at least equal to the fee, you will only be charged what you think is reasonable. We begin to “customize” your skills development and coaching program so that it takes the shape needed to meet your goals and objectives. Along with management, we choose the modules that address the skills gap of the team while keeping within budget. The workshop delivery method (live instructor led, webinar, e-learning) is also chosen at this stage. Based upon start dates, we always make sure we have ample time and allocate the proper resources. Your program will be delivered through various methods: Goal Aligned Selling™ skills development workshops. Delivered by Michael Caron or an expert in the specific topic, with in depth knowledge, experience and a record of success. This builds credibility, and buy-in from participants, which are essential to a successful program. For extra reinforcement, your people participate on synchronous on-line webinars and complete self-paced e-learning modules following each workshop. Management teams may review the key elements of skills development modules and make suggestions to “fine-tune” the program that will be rolled-out to their people. Managers should also attend the sessions with their people. Our workshops are unique in that they feel more like an interactive meeting than a training session. Strong emphasis on account bonding with the latest techniques in relationship building. Participants practice techniques in “real world” simulations. A Personal Action Plan is written by each participant detailing what, how, and when the techniques will be applied. Synchronous “Drive It Deep” reinforcement webinars. 1 hour learning / coaching sessions between workshops. These sessions are to practice and reinforce past material after the team has had a chance to use the skills in the field. These small, “bite-sized” interactive sessions make it easier for participants to put lessons into practice. Unfortunately, research reveals that training alone leads to minimal sustained behavioural changes within a sales team. Why? provide 1:1 coaching for your most important people. Our “Learning To Action” phase solves this issue and protects your investment. We work very closely with your team and your sales leaders to ensure that no great idea is left unimplemented. This is typically conducted simultaneous with the Deliver stage. This stage includes a combination of the following depending on your needs and budget. We schedule regular progress meetings with your senior leaders to develop action plans and assign responsibilities for the various tasks. You can choose us to do some or all the implementation. We will work closely with you or your sales leaders and provide the tools and coaching skills for these managers to be able to reinforce and coach their people in the Customer Focused Sales process. The most effective method to “coach the coach” is in the field if practical. Because it’s impossible to predict exactly how much time this stage will involve, we set aside a retainer amount for the duration of the program and reconcile our time monthly. 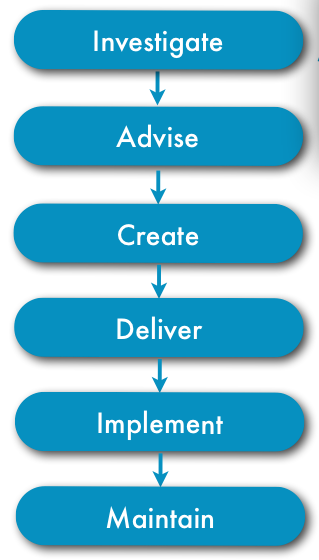 Typically, 2-8 hours of “Learning To Action” time per month is required to ensure full implementation of the program. After your program is delivered, we can ensure your team’s increased performance is sustained through our “Peak Performance” maintenance program. Quarterly tune-up sessions and on-going coaching keeps your team at their peak. The learner must be motivated to learn and to change his or her behaviour. During the central training experience, learning activities and media illustrate how new skills, knowledge, and attitudes help learners address job-related issues and achieve job-related goals. This phase succeeds when learners open themselves to new possibilities and resolve to master and apply essential interpersonal skills. A carefully crafted survey helps learners measure current levels of knowledge and application of a key interpersonal skill. Recognizing their own performance gaps further motivates learners and helps them focus effort in areas for improvement. Post-training assessments measure recollection of training content and skill use in the workplace. Learners encounter the cognitive details of a distinct interpersonal skill through presentation, reading, discussion, observation and analysis of realistic examples, simulations, and other activities. Typical content includes environmental cues that prompt skill use; a sequence of behavioural steps; relevant terms; examples of use and absence of use; and tips, tactics, and pitfalls for each step. The training of interpersonal skills requires rehearsing with humans—the intended audience for the new skills—in order to achieve competency. This real-time practice with another human being, whether face-to-face, voice-to-voice or online, is essential to soft-skill mastery. In a safe setting, learners rehearse the skill, receive constructive feedback, observe others using the skill and offer constructive feedback. The goal of this is to develop baseline competence and build confidence. Integrating new skills into job interactions requires commitment. A range of activities—discussions, testimonials, printable online planners, and others— give learners the clarity and resolve to apply their knowledge and skills. Managers of trainees can also reinforce and sustain skill application through coaching, recognition of skill use and modeling the skills.